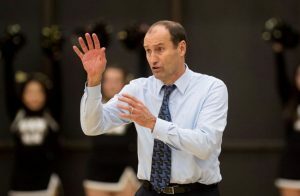 One of the winningest coaches in Division-III history, Steve Moore, head coach of the Wooster men’s basketball team, has decided to retire at the finish of the 2019-2020 basketball season. With over 800 wins in his 38 years of coaching in Division-III athletics, Moore has high goals for his last season and hopes to make it one to remember. In Coach Moore’s highly successful coaching stretch, his name reigns supreme in many Division-III honors. Moore has been the NABC District Coach of the Year for the Great Lakes five times and has been named NCAC Coach of the Year a record nine times. To add to his list of achievements, Moore has coached in Division-III athletics for 39 seasons, 33 of which were spent coaching the Fighting Scots. While at Wooster, Moore has had a total of 759 wins as leader of the team and hopes to add even more to the record in his last season this coming year. Some players wanted to reminisce on some of their favorite memories with Moore. “Every single one of my basketball memories have included Coach Moore, including winning the conference tournament my freshman year and also winning the NCAC regular season championship this past season.” said Hempy. “Coach Moore is legendary. While some of my memories involve the basketball and being on the court, I have many memories with Moore that just show how amazing he is in general,” said Scott. Doug Cline, current assistant coach for the Scots, will be taking Moore’s spot as soon as he retires. Cline is one of the most qualified for the job, as he has been at Moore’s side for more than 20 seasons. To add, Cline is also a 1995 graduate of the College and played under Moore’s wing. Cline strives to take inspiration from Moore’s teaching and weave it into his own coaching style beginning in the 2020-2021 season. “We will continue to work hard to recruit high quality student-athletes to Wooster, who can carry on the winning tradition that Coach Mose Hole, Coach Al Van Wie and Coach Steve Moore have established,” said Doug Cline in a press release on March 26. The Fighting Scots will return to the court under Moore’s direction for the last time this November, with their future coach Doug Cline close at hand. Don’t miss the Scots and one of Wooster’s most triumphant coaches in the 2019-2020 season!